I’ve got an old scanner (Canon MP250) and I wanted a way of automating the process of scanning documents and getting them into Evernote. There’s probably a way of doing this all in Keyboard Maestro, but I couldn’t work it out quickly enough. It’s my first time using KM and I’m still a little confused by it. But I know my way around Hazel and I used this Applescript from Macworld as a cheat. So, when I hit my hot key, KM opens up Image Capture, scans the document and puts it on my desktop where Hazel picks it up and imports it into my “!Inbox” notebook in Evernote where I can process it later, and then deletes the file from my desktop. KM then waits a minute and kills the Image Capture app. 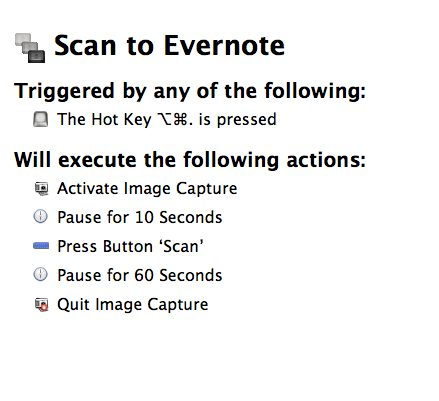 I have a similar process running for scans to Evernote, but its a bit easier for me since I use a Fujitsu ScanSnap scanner….